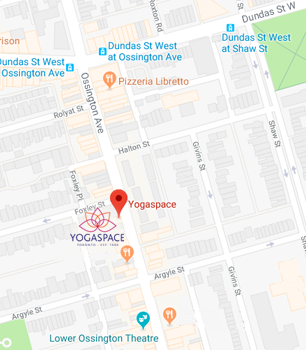 If you require more information or wish to register for workshops, pre-registered classes or wellness services please call the front desk at 416.516.9940 or email frontdesk@yogaspace.net. We accept VISA, Mastercard, debit, cheques or cash. Cars: There is free parking on Foxley, Halton, Argyle and Givens Street’s, all minutes away from Yogaspace. There is a self-pay parking lot, one block north of us on the south side of Dundas, just east of Ossington. Two-hour paid parking is also available on both sides of Ossington in front of the Centre. Bikes: There are lots of bicycle ring stands all along Ossington, particularly in front of Yogaspace.